Central Airlines was a regional airline (then called a "local service" air carrier by the federal Civil Aeronautics Board which was known as the CAB) operating scheduled passenger flights in Arkansas, Colorado, Kansas, Missouri, Oklahoma and Texas from 1949 to 1967. It was founded by Keith Kahle in 1944 to operate charter and fixed base services in Oklahoma and did not begin scheduled flights until September 15, 1949, just before its original certification expired. Central was then headquartered at Meacham Field in Fort Worth, Texas. The airline was eventually acquired by and merged into the original Frontier Airlines (1950-1986) which continued and expanded its service network. Backers and members of the board of directors initially included Ft. Worth oilman F. Kirk Johnson, former City Councilman R.E. Harding, Jr., Don Earhart and actor James Stewart; Stewart remained on the board for many years. Lamar Muse was president before going to Universal Airlines, Southwest Airlines and then founding Muse Air. Central started with a fleet of eleven Beechcraft Bonanza A35s, replacing them with Douglas DC-3s between November 1950 and May 1951. The DC-3s were reinforced by Convair 240s beginning in 1960s and beginning in 1965 the CV-240s were converted to Convair 600 propjets as their piston engines were replaced with Rolls-Royce Dart turboprops. Another airline in the region which converted their Convair 240 prop aircraft to the CV-600 turboprop variant was Trans-Texas Airways (TTa) which was subsequently renamed Texas International Airlines. In August 1953 Central scheduled flights to 19 airports. Central's 1955 network blanketed Oklahoma and extended to Amarillo, Dallas-Fort Worth, Little Rock and Kansas City; in April 1957 it served 29 airports. When the airline merged into Frontier in October 1967, Central's route system served 40 cities from Denver, Colorado to Kansas City and St. Louis, Missouri and south to Oklahoma City, Tulsa, Dallas and Ft. Worth, Texas. Like other "local service" airlines regulated by the federal CAB, Central was subsidized; in 1963 its operating "revenues" of $10.7 million included a $4.5 million federal subsidy. In 1961 the head office moved to Amon Carter Field (later renamed Greater Southwest International Airport) in Fort Worth. 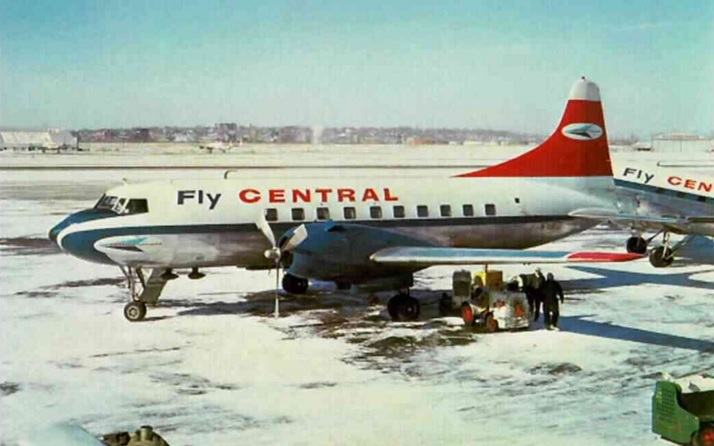 When it was acquired by and merged into the original Frontier Airlines on October 1, 1967, Central was operating Convair 600s and sixteen Douglas DC-3s. Central was planning to introduce Douglas DC-9-10 jetliners and the airline ran an ad in the Official Airline Guide (OAG) announcing the upcoming DC-9 service; however, DC-9 twin jets were never delivered or operated due to the merger. Frontier continued to operate the Convair 600s for a time but then retired them in favor of Convair 580 turboprops which were the backbone of Frontier's fleet during the late 1960s. Frontier was also a Boeing jet customer flying the Boeing 727-100 at the time and later operated 727-200 and 737-200 jetliners. Frontier would eventually introduce Boeing 737-200 jet service into a number of smaller cities previously served by Central including Fayetteville, AR; Fort Smith, AR; Joplin, MO; Lawton, OK; Manhattan, KS; Pueblo, CO; Salina, KS; and Topeka, KS.